This section describes the different management and feeding requirements of goose production for meat. It should be noted that, with very little variation, the same management and feeding recommendations apply to all types of goose production. 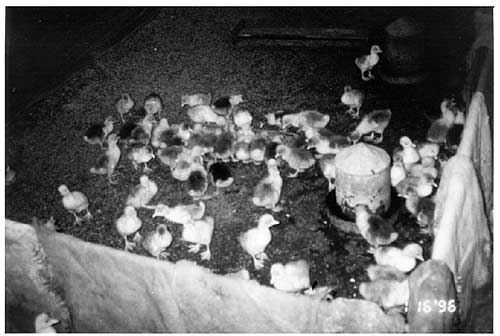 Brooding is the management practice to which young poultry are subjected immediately after hatching and for geese this is considered to be the first three weeks of life. The most important aspect of brooding is to provide extra heat so that there will be no temperature shock when the newly hatched goslings are moved from the incubator to the area where they will be brooded and grown. To ensure that the temperature in the brooding area is stable, it is important that the heat sources be turned on at least 24 hours before the goslings arrive. Success in raising geese depends to a large extent on the care and attention the young birds receive during the brooding period. Frequent management checks to make sure that the goslings are comfortable and have enough feed and water is one of the surest ways of raising healthy goslings. Almost any building can be used for brooding geese providing it is dry, clean and free of draughts and vermin. It is important to remember that the colder the ambient temperature of the room or building where the goslings are being brooded, the more heat will be required from the localized brooder heat source to maintain the temperature where the birds are located. Any brooder heat source that can be used for chickens can be used for goslings with the recommendation, depending on ambient temperature, that the number of goslings does not exceed one-third to half the number of chicks recommended by the manufacture. Energy sources may include electricity, oil, coal, natural gas, propane or other organic fuel. Normally the areas where the brooder heat sources are located will have a protective guard placed around them to reduce draughts and to ensure that the goslings will not stray from the heat source. This guard need only be in place for the first 2-3 days of the brooding period. A circular area is preferable for this purpose as it prevents the goslings from crowding into a corner. In areas where electrical interruptions are frequent, an alternative energy source should be used for brooding, although research in Canada has shown that goslings are resistant to temperature drops during the brooding period as long as they do not crowd and smother each other. When goslings arrive, the temperature at bird level directly under the heat source should be 36-37°C which can be reduced to 32-33°C at the end of the first week and to 23-25°C by the end of the second week. After the third week, no further additional heat source should be required unless the ambient temperature in the building is below 20°C. The best guide to deciding when to reduce the temperature and when to remove the brooding heat source is the behaviour of the goslings. If they are too cold, they will be huddled together close to the heat source and if they are too warm they will be far away from the heat source as shown in Figure 31. The goose has the fastest initial growth rate of birds kept for meat production. Table 6 presents an example of the increase in body weight of geese (the breed is the Hungavi Combi resulting from a three-way cross) during the brooding period. This rapid growth rate, combined with the fact that they are susceptible to overcrowding, means that it is very important that geese have adequate space during the brooding period. On average, maximum density per square metre should not exceed 14-20 birds during the first week, 7-14 birds during the second week and 4-5 birds during the third week. Even during the brooding period when the goslings are two weeks of age, they can be let out to graze, provided the weather is warm and it is not raining. This can reduce the building space requirements per gosling. Goslings should not be permitted out in heavy, cold rain until about five weeks of age, since before that they do not have sufficient feather cover to protect them. Almost any material can be used as a source of bedding for goslings e.g. straw, wood shavings, rice hulls etc. provided the material is dry, highly absorbent and that it is not easily compacted. These points are important for goslings as their droppings are moist and they tend to spill water onto the litter. For these reasons, it is recommended that the water be placed on wire mesh or on plastic or wooden slats which are supported by a frame to prevent spilled water from wetting the litter (Figures 18A, 20, 33). The watering space recommended during the brooding period is a minimum of 2 cm per bird and this can be provided by either a circular drinker or a linear drinking trough. Goslings require 1.5 cm of feeder space per bird which can be provided either with a double-sided linear feeder or with a circular feeder. For the first 24 hours after hatching, it is advisable to provide additional, more accessible feed to ensure that all goslings start to eat immediately. This feed can be put in egg trays which are placed on the litter in the brooding area for easy access. During the brooding period, a waterfowl starter ration in the form of either crumbles or small pellets is recommended and should be fed ad libitum. These starter rations normally have a crude protein level of between 16.0-18.0 percent and a metabolizable energy level of between 2 600-2 900 kcal ME/kg (Table 7). If a goose starter ration is not available then a chicken starter ration of similar protein and energy levels can be used. Mash feed can also be used if neither crumbles nor pellets are available. In many low income and food deficient countries, where feed mills do not exist, farmers must use the local sources of nutrients to provide essential nutrients such as ground cereals and chopped fresh grass. 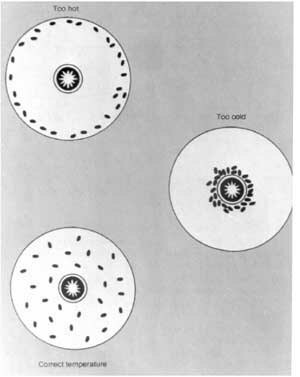 Such feeding systems, however, are usually protein deficient and can lead to very slow growth. If it is possible, the diet should be balanced with a supplement high in protein content such as soybeans, cotton seed or peanuts. The total feed consumption for goslings, depending on breed, for this initial three week period will be between 2.5-2.7 kg of starter ration. Goslings will consume between 7-8 litres of water during this period. If the goslings have access to high quality forage (ryegrass, white clover, cabbage, or even nettles) during the three week brooding period, this could reduce their intake of the complete ration by as much as 20 percent. When the goslings are three weeks old, it is possible to restrict their feed intake up to 75 percent of ad libitum. However, where a higher level of restriction must be exercised because of a shortage of either a starter ration or mixed grains, then every effort must be made to provide the goslings with young tender forage either through direct grazing or by cutting and carrying the forage to them. Fresh kitchen and/or garden waste may also be used during this period. If the goslings are required to graze, then any starter ration or mixed grains should be fed at night so that during the day the goslings will be hungry. This will increase their forage intake. If feed restriction is practised at this young age, it is very important to keep a close watch on the goslings to see that they remain in good health. After the brooding period geese can be grown to market weight under either intensive confinement conditions, extensive range-type conditions or a mixture of the two. The growing facility need not be sophisticated since these birds are not demanding - a simple shelter should be adequate. The most important factor is to ensure that the goslings are warm during the brooding period and protected from sun, heavy rain and predators, especially during the night. In hot countries, a wooden shelter is sufficient for this purpose. 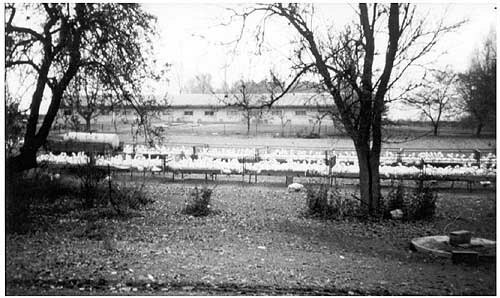 The growing of geese in confinement permits greater control of the environment. Although this has a number of advantages, it does not, however, capitalise on the goose's natural capacity to consume and utilise large volumes of forage. When they are grazing, geese consume not only grass, but also insects, snails, worms, etc. which can provide about 10 percent of their total protein intake. Furthermore, the strong legs of the goose combined with its aquatic tendencies means it can travel long distances if required to consume forage both on land and in the water. Finally, the production of geese on extensive pasture type conditions eliminates the need for expensive housing and equipment and requires only drinkers, feeders, fencing and shelters for shade. Because of the relatively high cost of the buildings and equipment needed when raising geese under confined conditions, geese are normally brought to market weight as quickly as possible. Broiler type geese can go to market at 8-9 weeks of age at a body weight of 4.0 kg and heavy type geese can go to market at 12-14 weeks of age at a body weight of 6.0 kg. 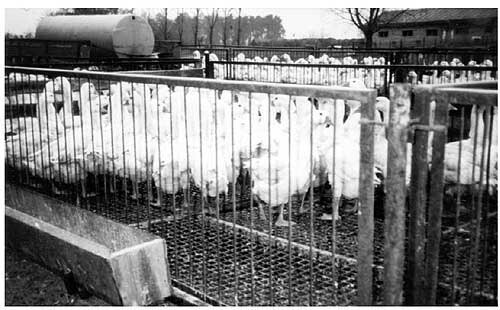 This means that geese produced under these systems are generally not plucked during the growing period (see Feather and Down Production). the risk of parasite infection is reduced. With the deep litter system, the drinkers should be located on a wire or slatted area so that spilled water does not wet the litter. One practice is to have one third of the floor space elevated with wire mesh or wooden or plastic slats to accommodate the drinkers. Note: Insoluble grit should be offered to geese at all times. The amount required is about 1 kg per 100 geese per week. At six weeks of age, the density of geese raised on deep litter should not exceed four geese per square metre, and only three after 13 weeks. For those raised on a slatted floor system, the respective values are seven and five birds per square metre. It must be noted that large geese in hot weather may require more space. 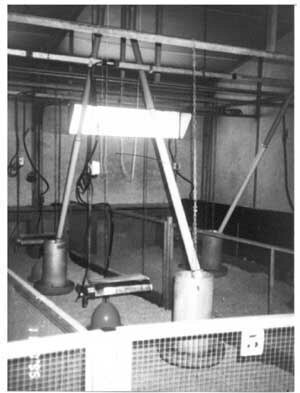 Under intensive confined conditions, geese should receive 15 cm of feeding space per bird. If at any time restricted feeding is practised, irrespective of the system used, it is vital that sufficient feeder space is provided so that all birds can eat at the same time. If this is not done, the more timid birds will simply not get any feed as it will be all gone by the time they get to the feeder. The watering space per bird should be about 5 cm per bird. Drinkers must be of a durable nature and should not be large. A drinker 20 cm square and 10 cm deep to contain about 3 cm of water is recommended by some producers, while both commercial hog and cattle drinkers have been reported to work very well with geese. It is important that the drinker does not spill a lot of water. When automatic drinkers are not available, it is possible to use any ordinary container, but it must be filled often to provide abundant fresh water. It is useful to adapt the containers so that the birds cannot bath in them. The type of feed generally fed during the growing period is a pelted waterfowl growing ration ranging from 10-13 percent crude protein with a metabolizable energy level of 2 700-2 900 kcal ME/kg (Table 8). If such rations are not be available then a chicken broiler or a chicken roaster ration of similar nutrient density can be used. While the recommendation is to use a pelted or crumbled feed for growing geese, in many parts of the world these are not available and, in such cases, the rations can be fed as a mash. The main advantage of growing of geese for meat under extensive conditions is the goose's unique ability to utilise high-fibre feeds and thus use a variety of types of forage. This ability holds true whether the geese are kept under well-managed pasture systems or under less structured scavenging systems. the birds are to meet a particular market demand at a particular time. It is the relatively low cost of the extensive production systems that allows for this flexibility. Providing geese with access to good quality pasture during the growing period, even without any form of feed restriction, can result in substantial savings with respect to grain consumption. Table 9 gives an example where geese with access to pasture consumed 34 percent less of the grain-based ration, yet their body weight was only 17 percent less than those grown solely in confinement. For the period from 12-14 weeks of age the geese with access to pasture consumed 48 percent less grain-based ration than the geese grown in confinement. These results also demonstrate the capacity of the goose to consume large quantities of good quality forage. Restricting the feeding of grain in any form while geese are on pasture is a very popular practice and one that is recommended. Depending on the level of restriction, it is a practice that can ensure the maximum use of available forage or any other feedstuffs. Almost all kinds of grain can be used in combination with pasture feeding. In Europe barley, oats, wheat, and maize are commonly used. In low income, food deficient countries it is necessary to test all local sources of grain for anti-nutritional factors before use. The greater the level of feed restriction, the more forage the geese will consume and the less selective they will be in what they eat. If necessary, geese will travel considerable distances to obtain forage. The level of feed restriction that is practised will depend on a number of factors. For example, if there are no alternative energy-protein sources available, then the level of restriction will be severe and the dependency on foraging and/or scavenging will be high. Under these conditions, the geese should be monitored closely, particularly if severe restriction is begun prior to three weeks of age. If the quality of the local forage is low and there are no other supplementary feeds, then there may be a need to cut and carry forage to the geese. This forage should be of the highest possible quality. If good forage is available, then even with small amounts of grain, high quality geese can be produced. The only difference is that they will be ready for market at an older age and the carcass will be leaner than that produced by a high grain (energy) ration. Even when available grain is not a constraint, it may be desirable to restrict grain intake to maximise the use of any available forage, and a restriction of between 0.5-1.0 kg of grain per goose per week is recommended. However, to achieve the desired market weight and have adequate fleshing, it is recommended that the geese be fed a complete ration for the last 2-3 weeks before killing. 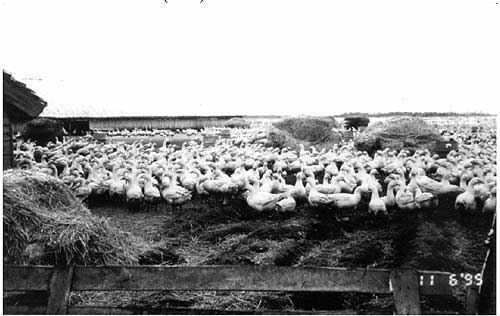 Depending on the body weight and condition of the geese at the beginning of this finishing period of 2-3 weeks, and the market for which the geese are intended, they may be fed either a complete ration similar to that in Table 8 or grain only. In Hungary and Poland, the practice of finishing geese in the autumn on oats only is very popular (Figures 32, 33 and 34). If the birds are too light, a mixture of oats and a complete ration similar to that shown in Table 8 is fed during this period of three weeks. When planting a pasture specifically for geese, it should be noted that they will eat almost any grass or clover species although they do not like alfalfa as much as other clovers. One pasture mixture that has been recommended in Great Britain consists of Perenial Ryegrass (Lolium perenne L.), Timothy (Phleum pratense L.) and White Clover (Trifolium repens L.). Stocking densities for geese on pasture are around 150 geese per hectare depending on the quality of the forage and how fast it is growing. Geese like new growth, so pasture management should be practised and it should include rotation and clipping. if predators are a problem, fences and secure housing at night must be provided.